Hope you are having a fun weekend, I am having a very lovely textilicious one and have just returned with my friend Sharon from visiting a new quilt shop that has opened up in the next but one village from us! 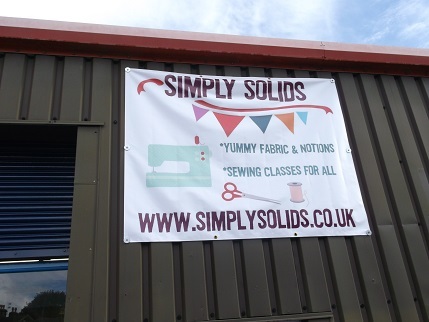 There has been great excitement at our knitting group waiting for this shop to open as it is a real live shop with classes and fabric and everything owned by Justine and Lisa from Simply Solids. 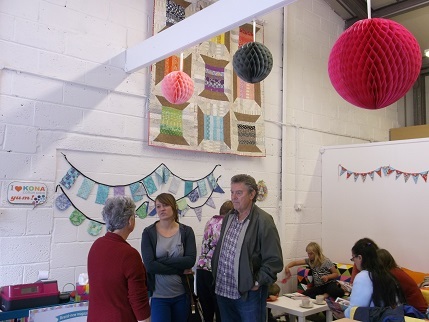 Look at this loveliness with all of the displays of cushions and quilts as well as the beautiful fabric and a cosy sitting area. 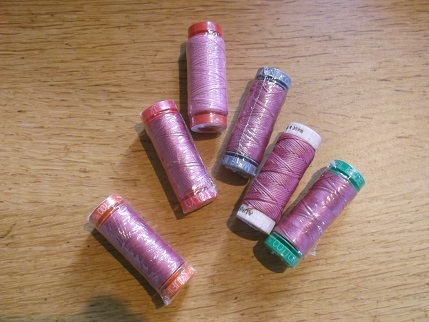 Plus they have a Gamill quilting machine that I think they will be renting time on (if I ever learn to machine quilt). There was far more fabric than just the displays in the middle of the table, a whole wall of bolts that in my excitement I forgot to photograph! And it is only a short bus ride away, and they are doing sit and sew groups in the evening 🙂 I am very happy about this as I did really enjoy going to a quilting group before I moved but that one is quite a long way from where I live now whereas this one will be on the way home.Fits in fantastically with my desire to do more quilting this coming year! 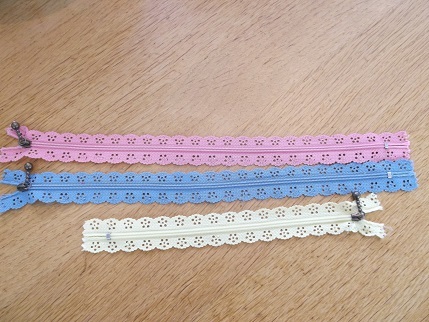 I have been buying from their online shop for a while now and had previously subscribed to their solids stash club. 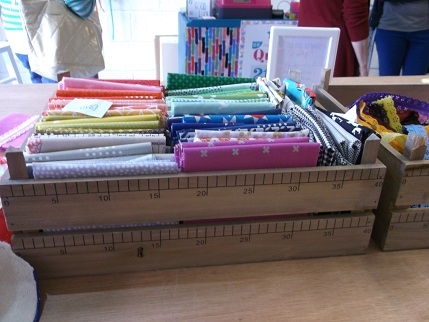 They also have lots of lovely prints as well in the shop and are going to offer classes so it is all very good. 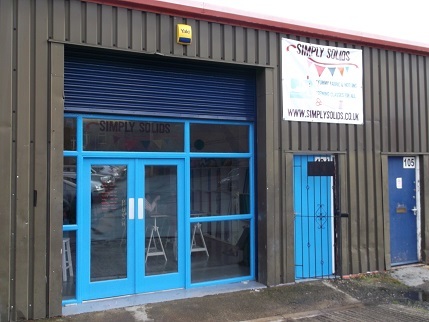 If you live near Huddersfield go and check our their website for class details. I did of course buy a little something from them (it would have been very rude not to!) 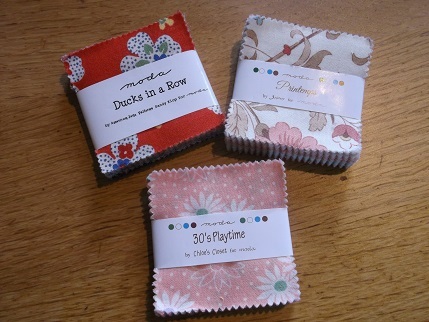 and the first things I will show you are these little mini charm packs. I have not had charm packs before I bought the one a few weeks ago but like how it gets you to use different fabric that you would not maybe have looked at. Just playing around with one of the sets while I was taking pictures I put together this which also features one of the fantastic lacy zips I bought from them – so pretty! 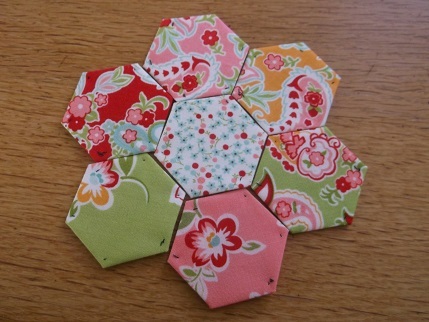 I spent this morning using the previous charm pack to make these two hexi sets for some more of the children’s aprons that I am making as Christmas presents which will be using up more of my solids stash. 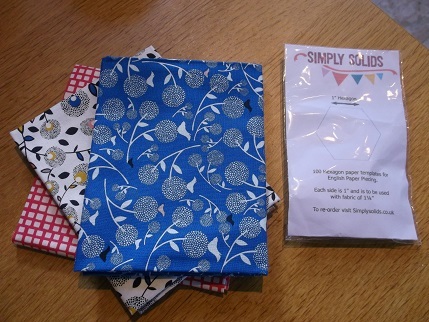 The very loveliest thing though was a fantastic goodie bag! 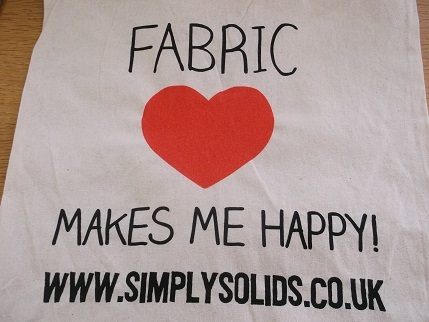 Not only is it a fab bag and that is such a true saying but there were lots of goodies inside. 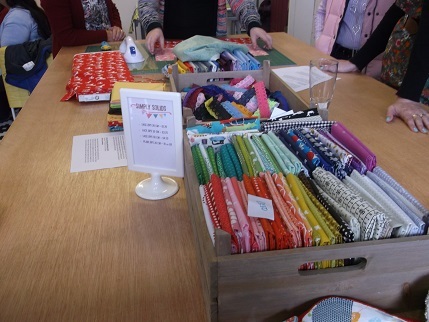 Look at all this stuff, free fabric and thread and hexi papers (Sharon is going to start doing hexis once she has finished her current bunting project). 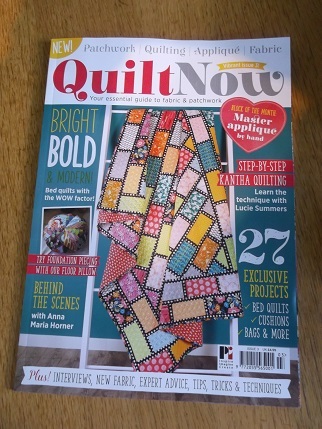 Also have bought (and subscribed to the first 3 issues for £5) to Quilt Now magazine which they had for sale. 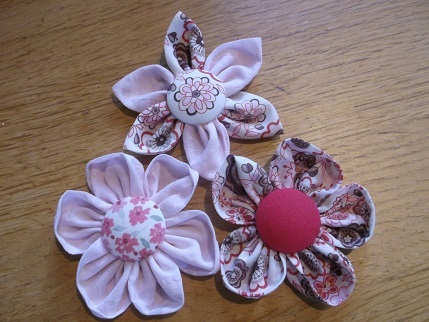 Will leave you with the fruits of my week’s work – not much stitching time due to having a very lovely new group of teacher trainees starting but have managed 3 more flower brooches. 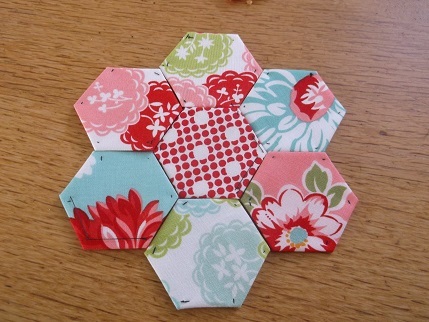 Sharon gave me the idea of making rounded petals by just folding the circle of fabric in half rather than in quarters. 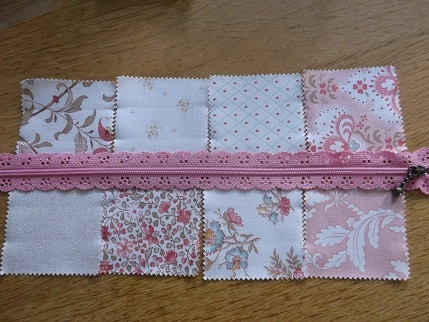 All of this fabric comes from stash and the pale pink and pink/brown flower patterns are from 2 charity shop blouses that I repurposed. Don’t forget to ‘like’ my giveaway post, I will be drawing the winner tomorrow. Thanks for visiting. Stitching and wine? If that ends well, you’re doing much better than I ever have!